2 sheets toasted nori sheets, shredded with scissors. Rinse chickpeas well with cold water and place in a large bowl. Add cooked wheat berries. Bring a pot of water to a boil. Add edamame and boil for 5 minutes, or according to package directions. Drain and reserve. In a small bowl whisk together sesame oil, soy sauce and sesame seeds. 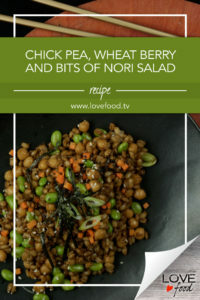 Toss with chickpeas, wheat berries and edamame. Top with green onions and bits of nori. *I’ll do the nori cutting on camera.